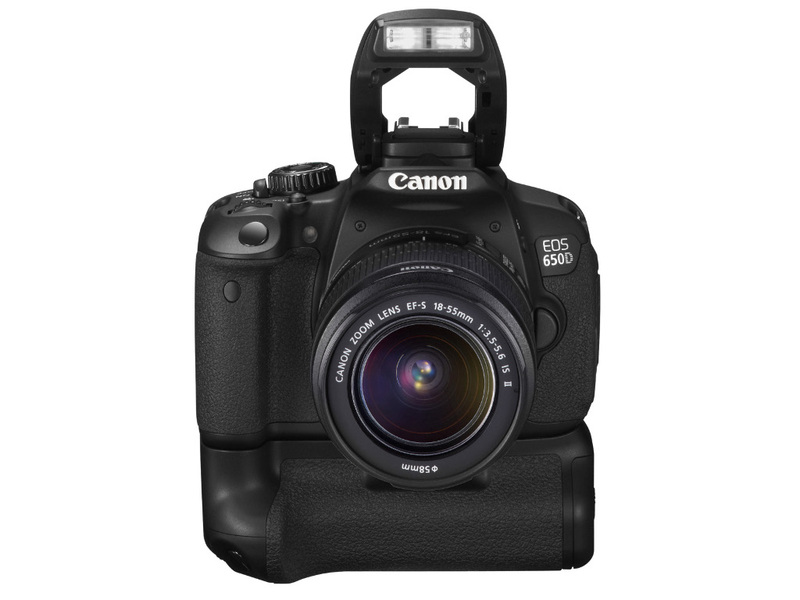 Canon today announced their latest consumer-oriented digital SLR camera – the EOS 650D. The xxxD series of camera bodies have been traditionally aimed at the beginner photographer and this model is no exception, although an estimated retail price of over £700 might be a bit off-putting for newcomers. The last few xxxD camera bodies have seen pretty staid updates. 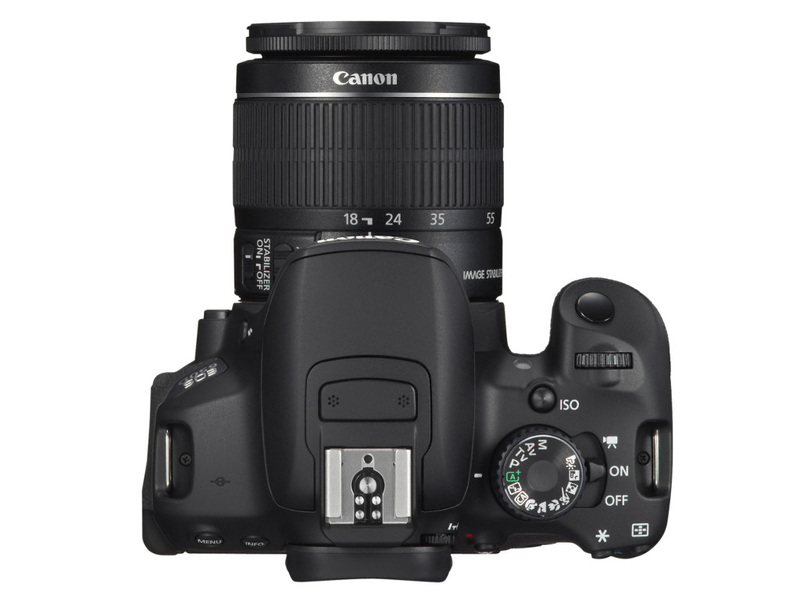 The 550D was still a popular choice even after the introduction of the 600D because most of the improvements focused on the video capabilities of the camera. And although the video mode has seen further improvements, there are a few upgrades that might tempt the still photographer to part with his or her cash. 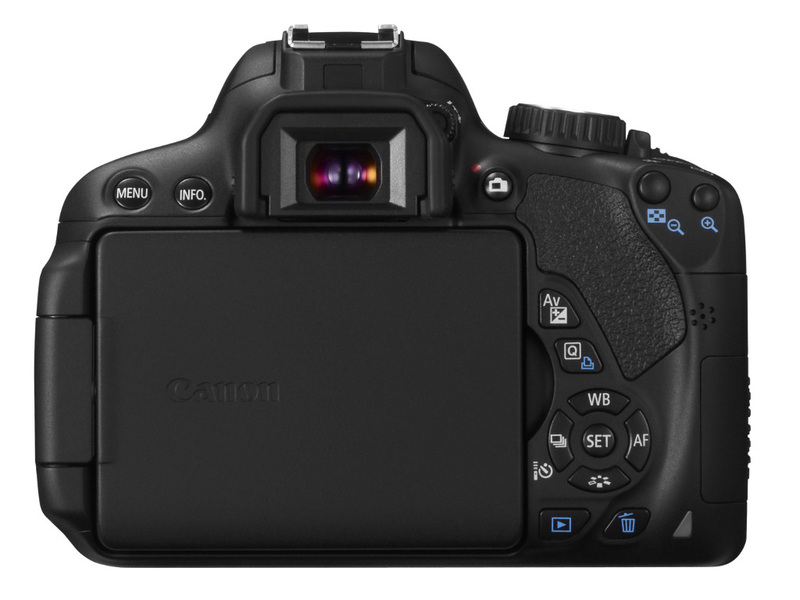 The 650D features an 18 megapixel sensor. A read through Canon’s press release suggests this in not the same 18 megapixel sensor that has appeared in a number of previous Canon cameras and is in fact a new design. Native ISO range is now 12,800 (up from 6400 on the 600D) which is always nice to have. Just to put this into context, my 5D has a native ISO limit of just 1600. The 650D should perform very nicely in low light. The camera processor has been upgraded (unsurprisingly) to the new DIGIC V variant. A few sources on the Internet have been quick to point out that this is the “same” processor used in the new 5D Mark III and the 1DX professional line of cameras. Well… the 1DX has two of them. Plus an additional Digic IV processor. I think a more realistic observation would be it’s the “same” processor that appears in the new PowerShot SX40 and the G1 X. It’s par for the course that newer cameras get newer processors regardless of where they fit in the product line. EOS 650D with pop-up flash. The camera is capable of “5 fps” which is up from 3.7 fps on the previous model. However, this is only half the story when it comes to continuous shooting, as you really ought to know how big the buffer is and how fast it will clear. It’s a frustration like no other waiting for your camera to digest the flurry of photos you just took and I can’t seem to find any more information about this particular model. I suspect it doesn’t perform brilliantly in this regard. On a more positive note, one clear improvement over its predecessors is an auto-focus system that features 9 cross-type AF points. For those that aren’t sure what this means, put simply the cross-type points are more sensitive and previous consumer line AF systems only utilized one of them in the centre of the array. Now you have 9. This will make a real-world difference to the auto-focus performance and, to be honest, it’s about time this trickled down into the lower end cameras. 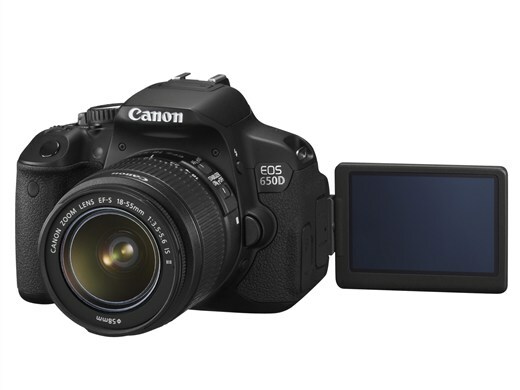 The two headline features of the 650D are the HD movie capabilities and the articulated touch screen. I think the latter is going to prove very popular with general consumers and perhaps this is one reason why Canon believe this camera can command a relatively high price. It really is a unique selling point and will make the camera just that little bit more attractive to gadget lovers. Of course, touch displays have been around on compact cameras and video cameras for years, yet it is still new to this particular segment of the market. But is it just a gimmick? Well in my opinion; no, I don’t think it is. You see, this camera is quite clearly aimed at performing dual roles as both a still camera and a video camera. The problem with adding video capabilities to still cameras is that, ergonomically, the design is not ideal. Anybody who has stood waiting and squinting into the viewfinder with their face pressed up against the back of the camera will know that it’s not a comfortable place to be for more than a view seconds, let alone a few minutes. A video camera is more often than not held away from the body with arms somewhat outstretched, and this pretty much necessitates an articulated screen. Now we’re left with the problem of accessing the camera controls. Pushing physical buttons on the back of the camera and turning noisy clicky dials just isn’t going to cut it for video use. A light-touch (I believe the screen is capacitive sensing) and quiet touch screen is infinitely more suited to the task. Also, being able to touch to focus will be one of those features that given enough time you wonder how you lived without. So, would I recommend this camera to a beginner photographer based on the specifications? Well, I’m not sure. Probably not. To me, this is a camera for somebody looking for an all-in-one device that is going to take good photos and good video. It’s as simple as that and I think it hit its target pretty much on the nose. If you want to get into bread and butter photography – and not video – I would still suggest you save some money and pick up a second hand xxxD or xxD camera body. glad I saved £650 and bought a beater 10D for £50 instead. I’m sure that these bells and whistles are great if you’re going to use them but for the money I’m still happy. Wow, and I just bought the T3i at a photography show after having them assure me at the Canon booth that no new models were coming out any time soon! LOL. Oh well, I got a really good deal, and I love my camera :). I know :). I’m really, really happy with my T3i. It takes incredible photos, but it just bugs me when people mislead me (that’s a polite way of saying lie to me LOL). Definitely. I’d never make a good sales rep, I’m too honest! Nice write-up – I’ve also heard this camera has some sort of continuous focus in video mode (special lenses required, 40 mm pancake being the first). Will be interesting to see how that works. Yes, I think that must be why we’ve seen a significant upgrade to the AF system as well. Canon have also announced a bunch of image stabilised prime lenses which only seem to make sense for video work so they are definitely pushing in that direction. It seems to be their unique selling point over Nikon at the moment, and they need it, because I have to say I’m quite disappointed at some their pricing lately.